Excellent-looking stuff, Kenny. Is that polenta/grits under those scallops? At first glance, I thought burratta, but I don't think that would be too nice of a combination. Ha, my bad, no grits that was the next day dish. Celeriac/parsnip puree in that with some horseradish and tahini. Roasted leeks and tomato, crab/shrimp sauce. Bit of curry here and there and a sumac/tellicherry pepper finish sprinkle. Last edited by Kenny H on January 30th, 2019, 6:55 pm, edited 1 time in total. I cook a lot, forget to share things here occasionally. Last night I made Michael Solomonov's Zahav lamb shoulder. Smoked for two hours, braised in pomegranate molasses/water for three hours, fired at 450 for 30 minutes. One of the better things I've made at home recently. Shreds with fork. With sumac onions on pita it was bomb. That looks fantastic! Thanks for sharing — I’m going to have to try that! Thanks! It's farily easy too. Good for a crowd. Don't have to smoke it first. They do, and I happen to have a BGE, so I did, but prob fine with just a braise. Miso ramen yesterday. Mostly following RamenLord's recipe. Eight hour pork and chicken stock, miso tare, chashu, egg. Miso brings great texture to the broth. Easier than an eighteen hour true tonkatsu stock. Beauty! Do you have an instant pot for stocks yet? It is worth it for those alone. Bone broths are a snap. Thanks! I do not yet have an instant pot. I keep almost pulling the trigger. I do need to get one. Everyone I know that has one tends to rave about it. Last night, Seared Duck Breast over Basmati Rice and Delicata Squash with an Orange Reduction. Last edited by Brian Tuite on February 17th, 2019, 11:05 pm, edited 1 time in total. Caught up with close friends over dinner at their house last night. They made homemade Korean chicken soup (sam gye tang). Paired with Sauvignon Blanc for the ladies, and a variety of beers for the guys. Found some fresh ricottini locally and decided to make fried calzones. Fresh riccotini (drier than fresh ricotta), fresh mozzarella and a bit of parmigiano-reggiano. Recipes were all from the ChefStep site. A change up for me. Udon with roasted short ribs. For lunch today I made this spicy Sardine pasta from leftovers and a can of Donostia sardines. It has a shallot, capers, parsley, black pepper, couple of spoonfuls of crushed Bianco diNapoli tomatoes (left from pizza sauce), two chopped Calabrian peppers, and olive oil. One sardine was crushed into the sauce and the rest roughly chopped. I added a bit of salty cooking water when combining rather than salting the sauce. Maniche pasta with roasted cherry tomatoes. Last night was Beef Stroganoff which is not photogenic. Tasted great though. Freshly caught Pompano, gutted, doused with olive oil, salt, garlic, lemon slices, dill and then oven baked. First time eating this fish; delicious delicate meat, reminded me of freshwater trout. Yum. Let's go catch some more! FLOATING ISLAND: Aka, île flottante, is commonly composed of poached meringue floating on crème anglaise, drizzled with caramel. Inspired by a recipe from Chef Laurent Zirotti, for a recent dinner party I served a "pre-dessert" version that was prepared with meringue and crème anglaise that were sous vide in jars, a deep-fried glassy pecan, and sous vide dulce de leche, all on a Chinese soup spoon. For the meringue and crème anglaise, I followed Zirotti's recipes (sous vide in 1 qt jars). Note, I prefer using cornstarch rather than creme of tartar, since the latter resulted in a somewhat sour tasting meringue. Also, I used two silicon-covered weights in the meringue jar to weigh it down. For the dulce de leche, Eagle Brand sweetened, condensed milk was sous vide in 8 oz jars at 181°F x 9 hr. For the deep-fried glassy pecans, I followed ChefSteps' recipe (which is actually trickier than it seems; I'll post some recipe notes on the CS site later). Staying in Alba right now and after a few days of travel we wanted to stay in. So the first place we discovered on our quest for protein was a great little salumeria a block from our apartment. Part butcher, part salumi, but all local small pig. I grabbed a very small tenderloin marinated in Arneis and some spices, and some pancetta made in house. Seasoned it a touch more, added some fresh torn basil leaves in the middle and wrapped it on the pancetta and tied it off. Asking for butchers twine was fun, we taught both the butchers the English for twine and they appreciated it. I do believe my request was the first they have had lol. So then we also hit a small fresh market and grabbed some tomatoes, cucumber, and squash. Made a simple fresh tomato and cucumber salad with more torn basil and olive oil and balsamic to start with some foccachia from the bakery right around the corner. The panchetta wrapped pig was the star though. Accompanied with with some squash sauteed lightly in the rendered panchetta fat with some tomatoes. Really wish it was easier to get better pork in the US without shipping it and paying a small fortune. Came out great for an improvised meal on the fly. The '71 Oddero was quite tasty as well. Life is good, cheers. That looks beautiful. Bravo. Regarding getting better pork, you might check local butchers about sourcing Country Time Farms. It's Lancaster County, PA based and superb. I grew up in Northern VA and my parents still live there. We have sourced Lancaster County meat locally on occasion, though I don't have current connections. 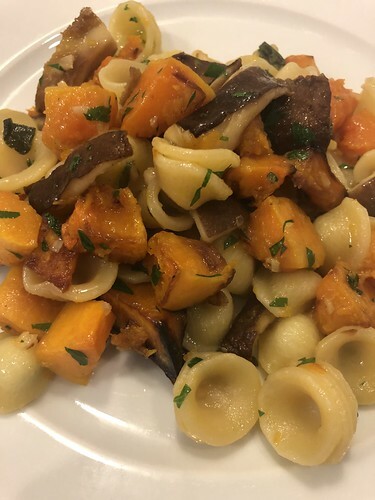 Roasted Butternut squash olive oil and salt, sauteéd Shiitake mushrooms garlic, fresh sage and minced parsley. combined with pasta and pasta water. Cioppino, a bit different than usual in that I used tomato paste and no fresh or canned tomatoes, and lobster stock for a more brothy version. Ghee was used for sauteing for a richer sauce and it seems to work well with saffron. It was also fun because all of the main ingredients were locally grown or caught. - after mussels open, turn off heat and add shrimp, crab, fish and seared scallops. The fish and shrimp will cook in about 2 minutes. Add fresh parsley and more oregano, then serve. "That looks beautiful. Bravo. Regarding getting better pork, you might check local butchers about sourcing Country Time Farms. It's Lancaster County, PA based and superb. I grew up in Northern VA and my parents still live there. We have sourced Lancaster County meat locally on occasion, though I don't have current connections." I don't remember the details as it has been more than 10 years, but you once commented nicely about a Capitol Hill restaurant that treated us very well before they ended up closing. If I recall you might have even gone there for a prom date or something similar and it was a nostalgic post. For the life of me I can't remember the name of that restaurant. Please let me know if you recall. The Somm actually gifted us a bottle of 82 Gruaud Larose in their last week. We had tipped him really well previously and of course shared everything we drank, but only on a few occasions, so I was stunned. Cheers, hope life is treating you well. Anyway I am thinking about just buying a whole pig or perhaps splitting it with a friend. I think that will solve the problem, if I can source it properly. Thanks so much for the info, I will check with them. All very fresh and local. Oh goodness, that was a long time ago! Was it (something like) La Colonnade in a hotel? I'm stretching the limits of my aging memory here. I also went to La Colline once on a prom date, also now closed, but don't think I would have been as nostalgic about that. My husband and I have talked with our butcher about getting a whole pig from Country Time, so I know it's possible. Good luck! If you like bitter things, and a strong flavor (from the fish sauce), this is an excellent salad. Didn’t cook a thing but so tasty! Buffalo mozzarella and Fresh olive oil from Rare wine co. Simplicity with a nice PYCM followed by Texier 2013 Pergaud. 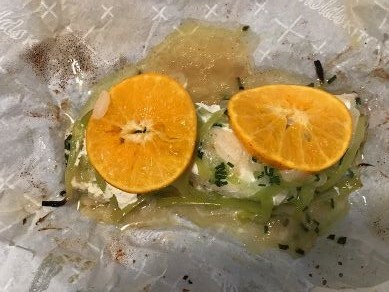 Great looking dish I will need to try! A seafood soup/stew, utilizing shrimp, mussels, a striped bass I caught in the fall, and some veggies . 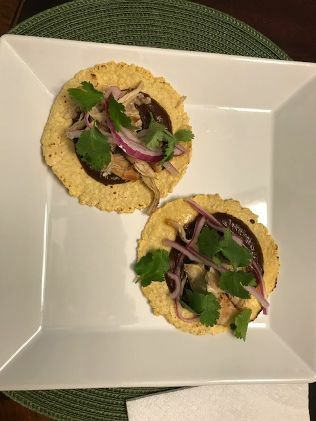 I love taco night--my wife is really finding her stride with tortillas. It helps with digestion. HRH can't eat them raw, but loves them this way.